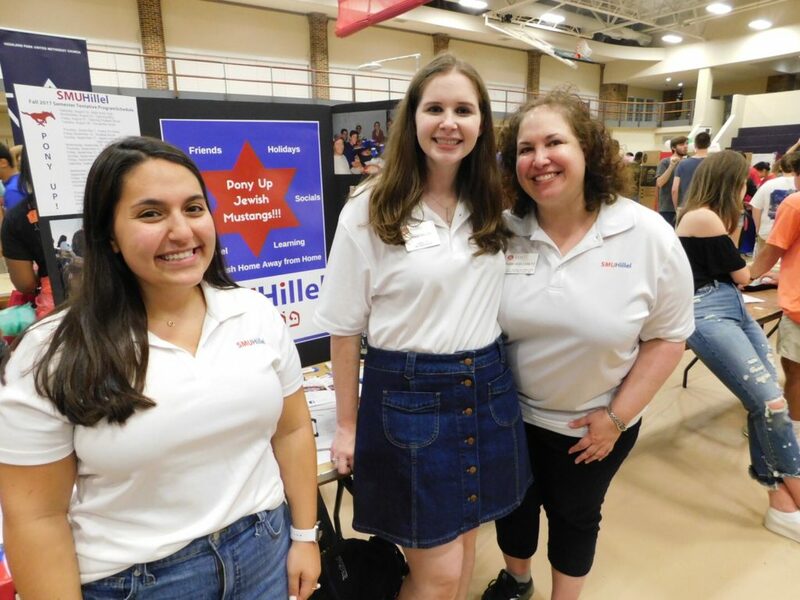 From left, SMU Hillel Co-Presidents Marlo Weisberg and Jackie Malish join Hillel Director Rabbi Heidi Coretz in introducing students to the organization during the first week of school. In this season for celebrating, Southern Methodist University’s Hillel has its proverbial, albeit invisible, doors wide open, with its constant programming and its mission to enrich the lives of Jewish students. Rabbi Heidi Coretz, beginning her 15th year as SMU’s Hillel director, brings her smile, spirit and student bonding to the holiday season, and year-round, providing community and connections. Sushi in the Sukkah, taking place at 7 p.m. –Sept. 26; an Oct. 19 Shabbat dinner hosted by Shira Lander, SMU’s director of Jewish studies; and an Oct. 28 “Challaween” baking event are only the beginning of this year’s programming. Jewish life has flourished through the years at SMU. Hillel, an Alpha Epsilon Pi chapter and the university’s Jewish studies program provide academic, social and spiritual opportunities. Whether participants want to learn about Jewish life, faith and culture – or to make and keep friends, Hillel provides inspiration and support. With more than 200 guests to more than 40 programs last year, Coretz is excited about the future. In addition to Sushi in the Sukkah and other October events, the Hillel calendar includes congregational invitations to students throughout the community; Interfaith programming, including a Passover Seder for nearly 100, a Bring Friends to Shabbat evening, and Yom Hashoah events; and leading the campus’ Good Deeds Day. Coretz and Hillel have become a home away from home. Weisberg, from Charleston, West Virginia, is following in the footsteps of her sister, Trish, both as SMU Hillel leader and as a SMU Hunt Leadership Scholar. Weisberg is co-president with Jackie Malish, the two joined in board service by Eliana Abraham, Sarah Crespo, Nathan DeVera, Adam Feldman, Solomon Guefen, Lauren Miller, Bibiana Schindler, Margo Schoenberg, Jake Waldman, Sam Waldman and Jordan Williams.